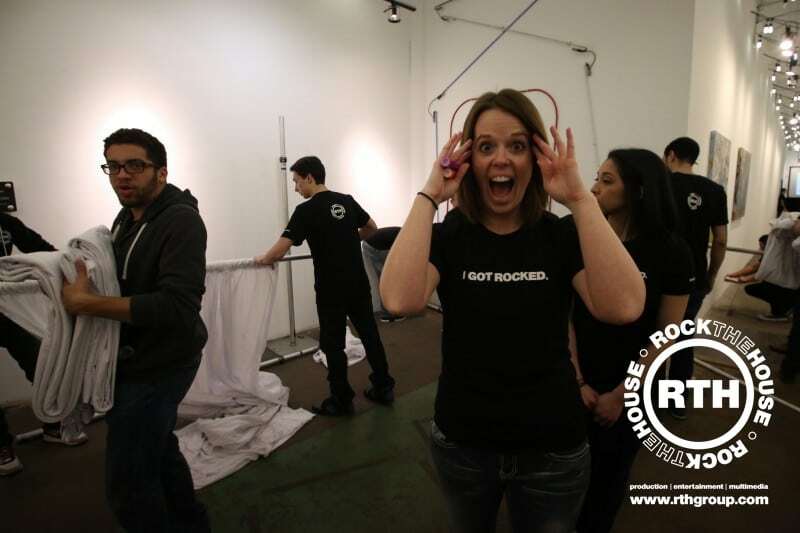 Rock The House Annual Meeting a Huge Success! If your first thoughts once you realize you’ve been scheduled a 9 to 5 on a Sunday include the idea of cashing in one of your sick days, then you don’t work for Rock The House. How does a live DJ, Simon Says, Burger King VS McDonald’s and a chance to win a fist full of cash sound? And that was all before noon. From the moment RTH team members arrived at their annual All-Staff meeting, the stage was set for something more colorful than your typical yearly staff assembly. Team members, who on this day felt more like guests of honor, were politely encouraged to meet and greet with folks they hadn’t met yet over coffee and an array of breakfast muffins. For members like myself, it was a chance to put names to faces that – to that point – I had only shared emails with. For others, it was an opportunity to relive memories with someone they hadn’t worked with in a long time. Perhaps even as long as last year’s Annual Kickoff Meeting. Two giant video screens accented both sides of the elevated stage, and there was enough lighting to host a respectable New Year’s Eve party. The stage, which was at least two feet off the ground, looked more prepped for a rock concert than a company meeting. There were a half dozen sets of high-end, and very loud, speakers strategically scattered throughout the Event Hall of downtown Cleveland’s Red Space, the perfect setting for such an event. The stage also featured a see-through glass bowl that was introduced to members as ‘the question bowl‘. Throughout the day teammates were encouraged to write relevant questions with the provided pen and notepad and were promised an answer by RTH managers at some point during the day. The effect was two-pronged; it allowed the meeting to flow smoothly with minimal interruption, and it allowed every person in the room a chance to ask whatever they wanted and receive a genuine response before they left. Red Space, created by Hot Cards, is a unique open gallery designed to host a variety of different events. According to isescleveland.com,”This raw and open space is perfect for eclectic events looking for something different.” Red Space has hosted everything from conferences and weddings to art shows and wine tastings. It truly allows the client to dictate the setting. 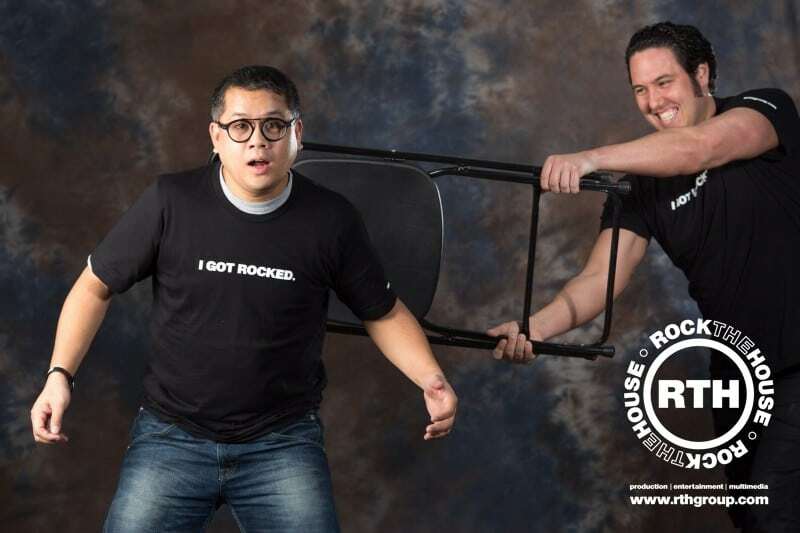 It was a perfect fit for Rock The House. After the meet and greet the RTH Founder & CEO delivered his annual State of the Company Address. The swirling lights were momentarily halted and the bass thumping music was muted during Matt’s speech. The confidence in his tone was loud enough. RTH Founder & CEO Matt Radicelli is the poster child of the ‘American Dream’. As a young boy he spun records in the bar his parents worked at, receiving enough notoriety in his craft to be featured on local news stations before he was a teenager. Before his senior year of high school Matt informed his parents that he would forego college. He had a real plan and wanted to be the master of his own destiny. 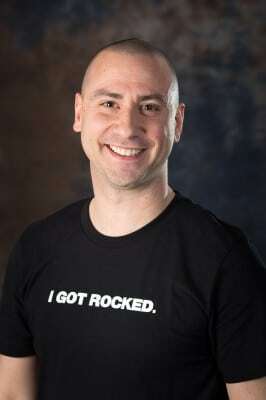 His passion culminated into two business ventures, and in just two short years after graduating a DJ company named Rock The House was born. The rest is history. He now pilots a company that has grown exponentially. It created it’s own niche and services it’s demographic better than anyone near it’s region. Perhaps Matt’s vision is his biggest asset. 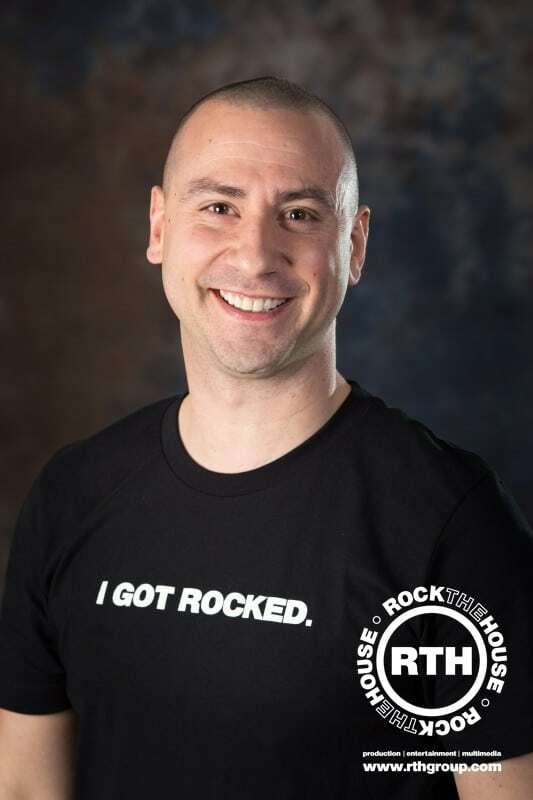 His passions are meticulous and contagious, exhibited through RTH COO Ryan Konikoff. A strong team of upper management staff coupled with a hands on owner who embraces innovation resonates through to the rest of the employee’s at RTH. 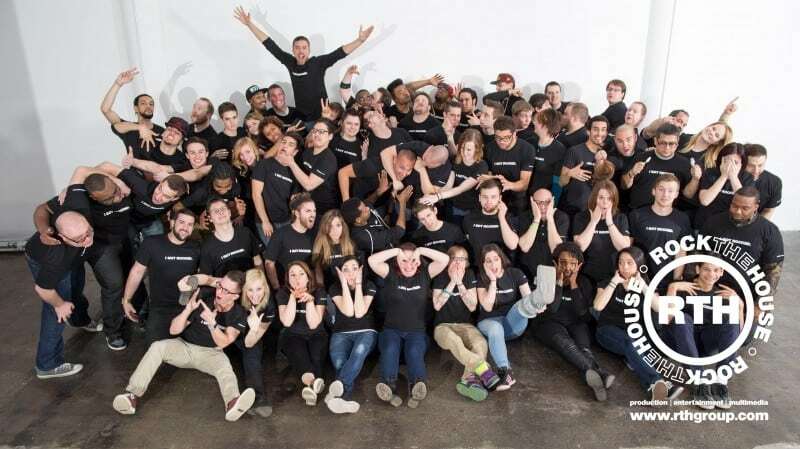 It’s a workplace that has balanced the challenge of being both demanding and nonchalant. RTH prides itself and hiring and promoting from within, and it only hires the best outside help whenever absolutely necessary. It’s a perfect storm, and the meeting on Sunday mirrored that image to a T.
During his address Matt also commented on the future of his business. One of the more notable points was his confident ‘five-year plan’. According to Radicelli, in five years RTH will have the resources, confidence and ability to put on shows nationwide. News like that is inspiring. It instills comfort to its team members. Simply knowing that the company you work for has legitimate plans to keep growing is empowering. 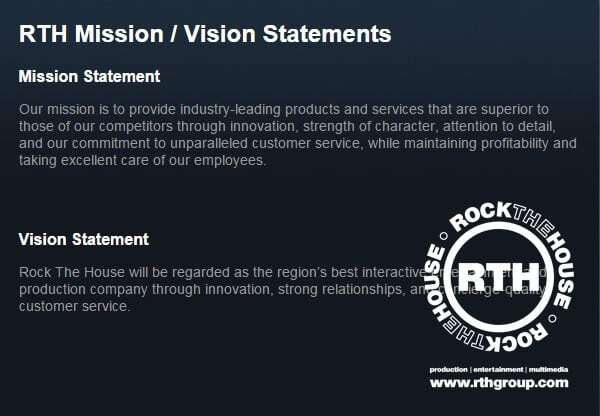 The real magic, and true foundation, of RTH is embedded in it’s mission statement. Training programs are a vital and essential part of RTH, and they have been continuously evolving over the last 15 months. Spearheaded by Konikoff and Executive Assistant Amy Van Duyne, this curriculum provides competent skills training for a variety of jobs assumed by employees of RTH. Graduating members of these courses were honored with certificates and pictures during the meeting. These updated classes were a proud accomplishment of the management staff at this year’s meeting. The all day affair didn’t just entail team building exercises and listening to speeches. Peppered into the afternoon activities was a little hands on training that proved to be very beneficial to rookies and veterans alike. Another point of the meeting was to stress the importance of attention to detail. Hanging drape is an essential component of a multitude of RTH shows, and a brief re-teaching course of how to do it was an inevitable stop along the map of the days activities. A recap of the terminology paired with some secret tips and tricks allowed team members to pick up on a few things they either didn’t know, forgot, or just were never formally taught. The heights and weights of the drapes used in some shows can be substantial, and the short learning session can be considered a safety issue if nothing else. Carnival Cruise Director Eric Brouman was brought in to offer some of the core values coveted by his employer. The theme of this interaction was to highlight what Brouman called ‘being on‘, stressing positive attitudes and professional appearances the moment team members walk into an event. 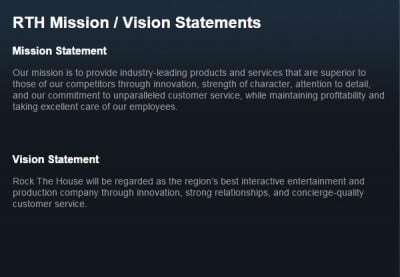 As expected, the similarities between the two entertainment company’s were bountiful. As part of his module, RTH members were split into two groups and instructed to come up with their own core values. After the lists were compiled each team voted on their favorite codes. A brief discussion and video recap highlighted Brouman’s segment. Then there was the opportunity to meet with Radicelli in a smaller, more intimate setting. This module was classified as SWOT (strengths, weaknesses, opportunities and threats). During this time meeting attendees were allowed to voice their concerns of ways RTH can improve. There was also a chance to celebrate the wins for Rock The House, and a promise from the founder to find ways to eliminate some of the things that were deemed fixable by his staff. At it’s conclusion teammates were allowed to voice their opinions about the good and the bad, and more importantly, were allowed to speak these thoughts straight to the highest person on the totem pole. While Sunday’s meeting had all the flair of a high profile party, the intent and attention to detail provided much more than your regular company meeting. We laughed. We learned. We focused our energy on one goal; being the best and becoming better.